St. Mary's Seminary of Perry County, Missouri, purchased land formerly owned by the Thomas family for a new church in 1904. The church was dedicated and staffed by Vincentian Priests in 1905. 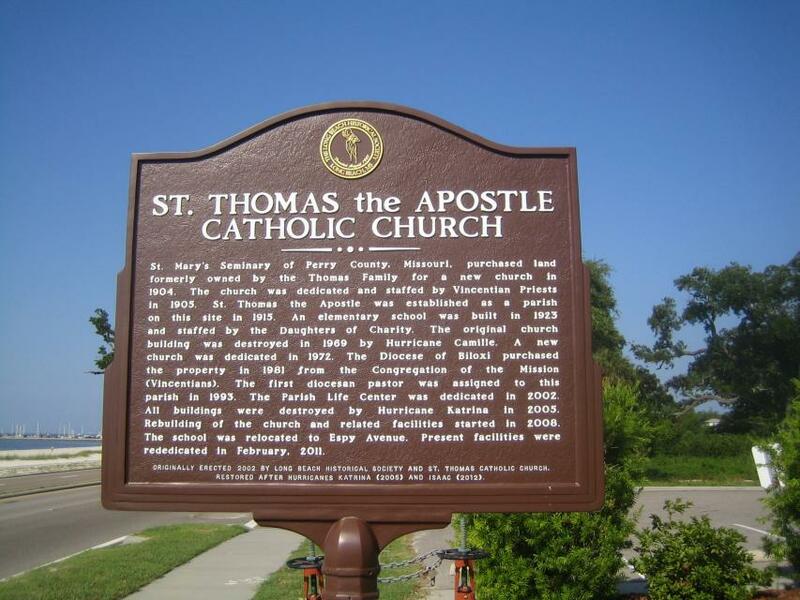 St. Thomas the Apostle Parish established 1915. Elementary school built in 1923 and staffed by Daughters of Charity. Original church building destroyed in 1969 by Hurricane Camille. Second church dedicated 1972. Diocese of Biloxi purchased property in 1981 from Congregation of the MIssion. First diocesan pastor assigned to parish in 1993. Parish Life Center dedicated 2002. All buildings destroyed by Hurricane Katrina in 2005. Parish started rebuilding facilities in 2008. This marker can also be identified by its HM code. You can use the hashtag #HM1JA9 in tweets, and any other place where you might refer to this marker, including when searching on this site.